URGENT APPEAL: Marines Need Your Help! Jeffrey De Young is 19 years old and a Lance Corporal in the US Marines stationed in Afghanistan. 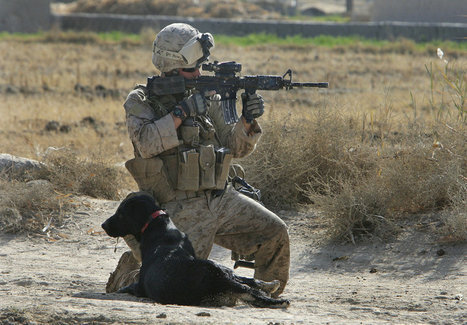 He is a dog handler, and his dog is a 2-year-old black lab named Cena, the shortest Marine in Afghanistan. You can read all about him and Cena HERE. UPDATE: For more pics of Jeff and Cena, CLICK HERE. Jeff and Cena were both recently injured. Jeff is asking for olive drab shirts and socks for him and his fellow dog-handler Marines. His mom also asks that IV supplies be sent to them as well. P.S. Some dog treats tucked into those care packages would be so cool! Also, a couple of paperback books, CDs, or movie DVDs will be so appreciated by our Marines! Care Packages and more - Multiboxing in World of Warcraft and Beyond!